Movistar Yamaha MotoGP’s Valentino Rossi and Maverick Viñales began the first free practice sessions at the Sepang International Circuit on a high note. The teammates commenced preparations for this weekend’s penultimate round of the championship and showed a competitive pace right from the get-go. Both riders spent a fair amount of time topping the rankings, and they ultimately finished the day in fourth and sixth place respectively in the combined free practice results. Rossi had his game-face on today in Sepang. This weekend he is focused on decreasing the 15-point deficit in the championship standings to potentially earn him the second place. With this motivation spurring him on, the nine-time World Champion made the most of the dry 45-minute practice time and set a solid pace, spending most of the session in fifth place. He upped his best lap to a 1’59.767s towards the end of FP1, which earned him second place, 0.070s from first. The afternoon session under hazy sunshine allowed the Doctor to once again show a competitive pace. 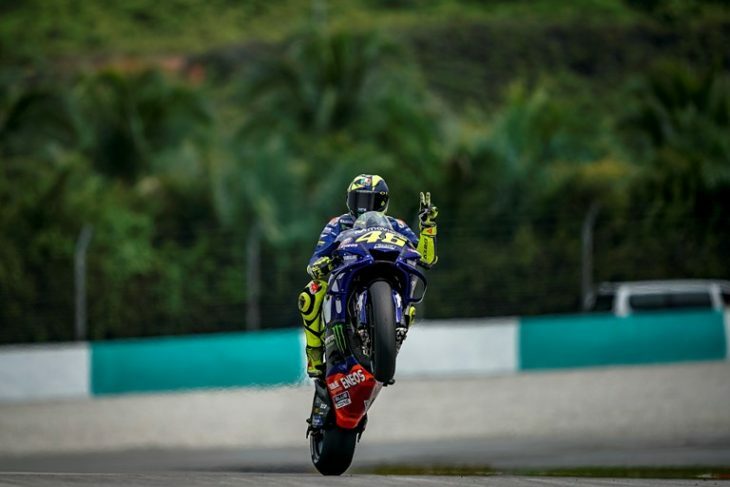 With a little less than 20 minutes to go, he put his Yamaha in the provisional top spot and continued to lap closely to his 2’00.035s time as he continued his second run. In the final four minutes the pace picked up, dropping the Italian to sixth. He responded by setting a 2’00.017s, but it kept him in the same position in the FP2 rankings. However, his morning time was fast enough to earn him fourth place in the combined free practice results, 0.159s from the top. Viñales still felt a buzz from last week’s victory in Australia and entered the Sepang track in FP1 ready for business. Perfectly dry conditions helped the Spanish rider position his YZR-M1 at the top of the timesheets. He further upped his game halfway through the session with a best lap of 2’00.453s, good for provisional first place until the final five minutes. With rain posing a potential threat in the afternoon, the number-25 rider put on a softer rear tyre to make sure he stayed inside the top-10. He had dropped back to fifth but retaliated by setting a 1’59.928s to take third, 0.231 from the top. The usual tropical showers at Sepang didn’t make an appearance in the afternoon, which meant the young rider could proceed making progress on his bike’s dry set-up during the FP2 session. He tried various settings and tyre options until, with eight minutes of the session remaining, it was time to put his bike to the test under similar conditions to those expected for Sunday’s race if it stays dry. He improved his fastest time of the day to a 1’59.802s, taking fourth in the FP2 results, 0.194s from first. This lap put him in sixth place in the combined FP timesheets. Johann Zarco kicked off the Malaysia Motorcycle Grand Prix today in strong form. The fast Frenchman initiated the hot and humid weekend with a fast pace in FP1 this morning and improved on his quickest time later by 0.567 seconds on the last lap of the second Free Practice to conclude Friday with a provisional Q2 position in eighth. His Monster Yamaha Tech3 teammate Hafizh Syahrin, who is the only rider of the permanent MotoGP field, who haven’t had a test this year before the Grand Prix at the Sepang International Circuit, had the difficult task to make up for this in just two sessions today. The local hero managed his mission well to miss out on the top 10 by just 0.867 seconds before FP3 at 10.55 local time (3.55 CET) tomorrow decides about the Qualifying entry.